Joyce's suggestion (INP, iii, 586) that this peak is so named because of its resemblance to a pilgrim's staff with a crooked top seems without foundation. Trostan is the highest mountain in the Antrim Hills area and the 419th highest in Ireland. 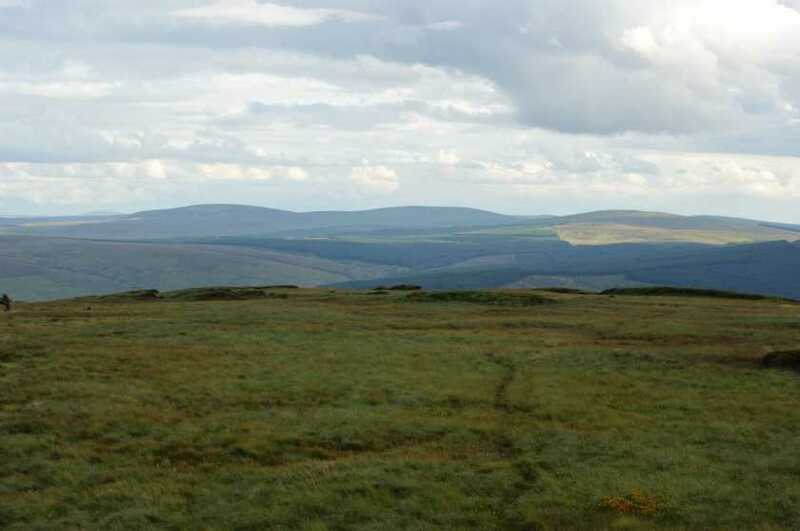 Trostan is the highest point in county Antrim. Consensus suggests that Antrim's scenic wonders mostly lie on the coast and in the valleys, and Trostan bears this out. Its height is its only overt distinction, being otherwise a high plateau of varying degrees of saturation underfoot and assorted levels of peat erosion. Consensus promotes the use of the waymarked Moyle Way to approach Trostan. From the south start from the small layby opposite the entrance to Glenarrif Forest Park (201207 A) or at Essathohan Bridge (190217 B). The Moyle Way can also be used from the west (start at (157238 C)) which is probably an easier ascent, but it is not as attractive -unless of course doing the whole Way! The Way is well used and can be difficult in places, especially if wet. There is varied walking - through the forest, following the river and then open hillside. The Moyle Way is left as head north for the summit - a fenceline runs up over the broad flat summit area, not far from the cairn and trig pillar which stand high over the eroded landscape. Views can be far reaching and spectacular on a good day.